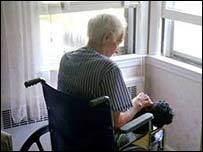 Human rights legislation is failing some vulnerable older people, according to charity Help the Aged. The charity said gaps in the law left older people exposed to mistreatment which cannot be fully investigated or dealt with under the Human Rights Act. It said that while statutory services were covered under the Act, the majority of care - which is contracted to the private sector - is not. It urged the government to push forward with its planned equality bill. The bill, included in the 2005 Queen's Speech, will establish a Commission for Equality and Human Rights, among other aims. Help the Aged said such a body would have powers to champion older people's rights and could better protect them from abuse and neglect from carers. The charity said the majority of older people's services - including more than 90% of care home places and nearly 70% of domiciliary care hours - are contracted out to the private sector, which is not covered under the Act. In a report titled Rights at Risk - Older People and Human Rights, it said "thousands of older people [were given]... little protection in law if abuse takes place". The charity identified "institutional cultures" which breach human rights and cites major delays in providing essential services, and limited services with little choice. Lack of hygiene, the use of inappropriate restraints, both chemical and physical, and restricted access to food and water have been reported to it as existing in some health and care settings. Senior policy advisor Tessa Harding: "High-profile and widely publicised cases of elder abuse and neglect rightly provoke revulsion and anger. "Unless strong new laws are introduced to give older people specific protection against breaches in their human rights, the sorts of cases seen [recently] will continue to be treated only as a matter of poor standards." She said a commission was needed to "deliver firm, clear messages about older people's human rights to all providers of health and care services".